Body By Natures calcium supplement is derived from natural seaweed. This seaweed, which is red in colour, creates wholefood calcium which is made up of a whole spectrum of vital nutrients in a highly, bio-available form. We only use seaweed which is found in the purest and cleanest waters on earth. Calcium supplements are very popular among an estimated 3 million people with osteoporosis (thinning of the bones). Vitamin D is often prescribed alongside calcium as it aids with absorbing it into the body. You will find that even healthy women continue to take calcium to keep their bones strong. Your body doesn’t produce calcium, so you will have to get it through other sources such as eating dairy products, dark green leafy vegetables or fish like sardines. You may lack in calcium levels if you follow a vegan diet, be lactose intolerance, consume large amounts of protein or sodium, or have osteoporosis - our Calcium supplement can then help. 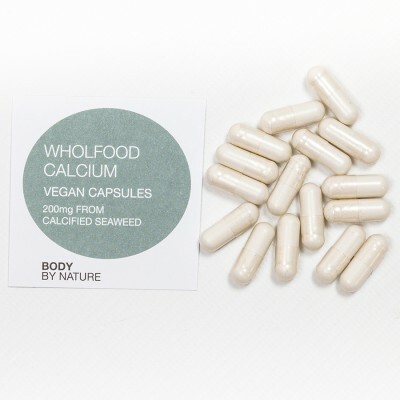 Each capsule yields 200mg elemental organic calcium plus 74 other trace minerals. Please refer to bodybynature.co.uk for the comprehensive list. Whole-food Calcium carries Organic Trust Certification and is a whole-food product with no additives. Calcium is important for optimal bone health throughout the entirety of your life. Provides support to muscle function. Helps with normal neurotransmission. Assists in ensuring normal energy metabolism. Adds to the normal function of digestive enzymes. This product is harvested from clean, pollution-free, mineral-rich Atlantic waters. Keep cool, dry and out of direct sunlight. No need to refridge rate. Keep out of reach of children. If seal is broken on purchase do not use.